Everything you love about classic stuffed peppers in a cozy soup made in a pressure cooker, slow cooker, or on the stove. 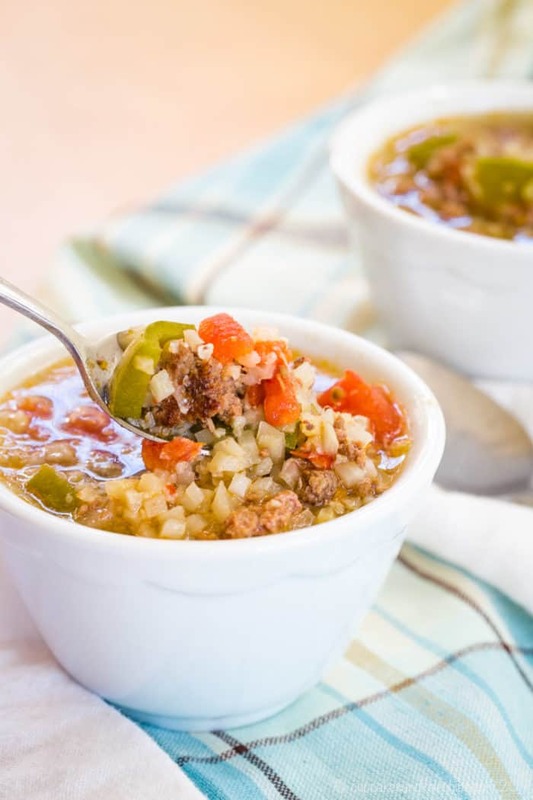 This keto-friendly soup used cauliflower rice instead of regular rice. 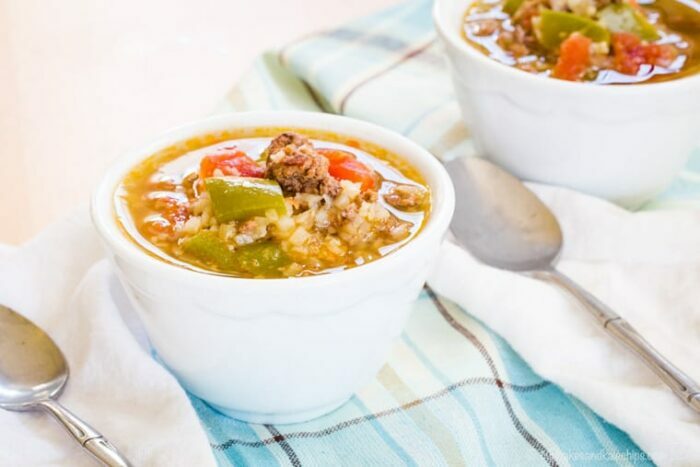 Low Carb Stuffed Pepper Soup has everything you love about a classic stuffed pepper recipe, but in a cozy soup that will warm you from the inside out. Plus by swapping the standard cooked rice for cauliflower rice, this is also a low carb soup recipe. There are even options to make it in your Instant Pot, Crockpot, or right on the stovetop. 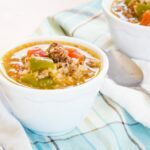 This Slow Cooker or Pressure Cooker Low Carb Stuffed Pepper Soup recipe is sure to be an easy low carb dinner recipe your entire family will love. My youngest takes after daddy when it comes to soup. Or so he says. And it did not go over well when I made Shepherd’s Pie Stuffed Peppers. My oldest hates tomatoes. He had a bad tomato experience when he was little and still won’t touch them. He picks them all out when I make Slow Cooker Tomato Basil Pulled Chicken. Green peppers? Don’t get me started. So why on Earth would I make this soup? Sometimes what mama wants mama gets. And I actually got both the low carb soup I wanted AND positive reviews from the family. I absolutely loved the beefy flavor and all the cauliflower rice and veggies. The picky little one devoured it in about three minutes and drank every drop out of the bowl. And the husband and big guy said it was pretty good. Given their attitudes about things like soup and tomatoes, I think that counts as a rave. 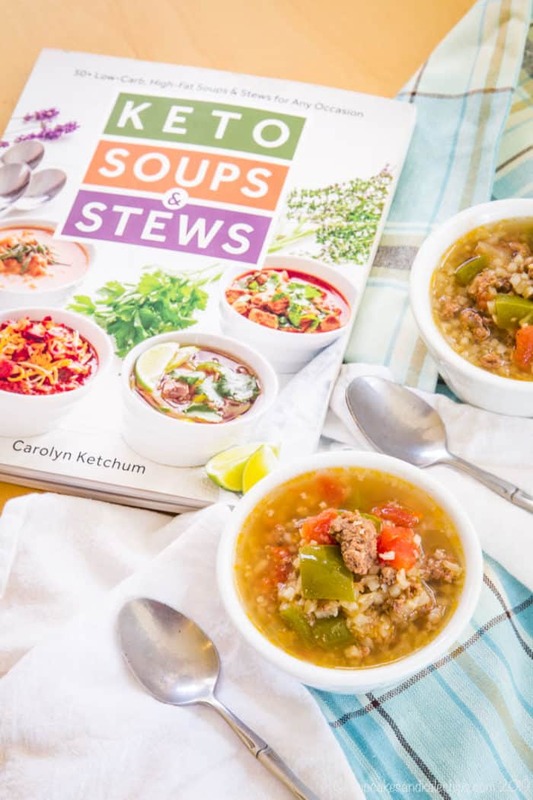 This easy and flavorful low carb soup recipe is from my friend Carolyn’s cookbook Keto Soups & Stews. In this cookbook, she gives you over fifty recipes for the comfort food you crave any time of the year. Her blog All Day I Dream About Food is already a treasure trove of low carb deliciousness. But she is sharing even more of her amazing recipes in her collection of keto cookbooks. As with all her cookbooks, Carolyn starts out by giving you all of her best tips, tools, and ingredient recommendations. Then she dives into a chapter on making your own broth, but of course, tells you her favorite brands if you want to buy it. The chapters are then divided by proteins (chicken soups and stews, beef, pork, and even seafood), plus a vegetarian chapter. And each recipe has a full-color photo with a photo index at the back of the book. The Chicken Cordon Bleu Soup, Italian Meatball Veggie Soup, New Mexico-Style Red Pork Chili, and Mushroom Brie Soup are totally calling my name. How do you make Low Carb Stuffed Pepper Soup? Saute the ground beef until it is no longer pink. Add onion and garlic, then season with salt and pepper. Stir in beef broth, chopped bell peppers and tomatoes, beef broth, and Worcestershire sauce. Seal and cook using the soup function. Release the pressure and add cauliflower rice, then use the soup function to cook for another few minutes. Cook the beef in a skillet, followed by the onions and garlic. Transfer to your slow cooker with the remaining ingredients except for the riced cauliflower. Cook on low for 6 to 8 hours, adding the cauli rice during the last 30 minutes of cooking. In a large pot, cook the ground beef, then add the onions and garlic and saute for a few minutes. Add everything except the cauliflower to the saucepan and bring to a boil. Reduce heat and simmer for a half hour, adding the cauliflower rice for the last five minutes. 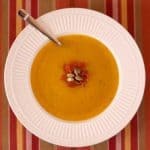 What is another low carb soup recipe you can make? Creamy Cauliflower Broccoli Cheese Soup uses a veggie-packed secret to make it as creamy and cheese as what you get at a restaurant. Greek Avgolemono Chicken Zoodle Soup keeps the fresh Mediterranean flavors of this classic soup but swaps out the rice for zoodles. Stove Top or Instant Pot Butternut Squash Soup with Sage and Thyme is smooth and velvety and soul-warming. 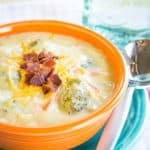 Low Carb Keto Zuppa Toscana is a copycat without the carbs from Shugary Sweets. What are my favorite low carb and keto cookbooks? Since Carolyn is, in my eyes, the Queen of Keto, I consider her cookbooks the absolute authoritative sources on low carb cooking and baking. I don’t always eat low carb. But I am gluten free and do try to watch my consumption of grains. So her recipes fit well into my lifestyle. And for my husband and kids, if I’m putting a scoop from her Chicken Enchilada Skillet on Brown Butter Cauliflower Rice or in a lettuce wrap, they can have theirs with brown rice or tortillas. In The Everyday Ketogenic Kitchen, you’ll get all the basics with information and recipes for every meal of the day to get you started on your low carb journey. Easy Keto Dinners will help you with your menu planning so you can stay low carb even on the busiest of nights. You will be drooling over Easy Keto Desserts, especially if you have a sweet tooth like me. And you’ll be wanting to start your day with Easy Keto Breakfasts. 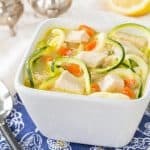 Where can I buy Easy Keto Soups & Stews? You will find this book on bookstore shelves and possible even in Costco, but you can always get it on Amazon. You’ll be putting this recipe on your regular dinner rotation. Whether you follow a keto lifestyle or not, I guarantee you will love the flavors from classic stuffed peppers. 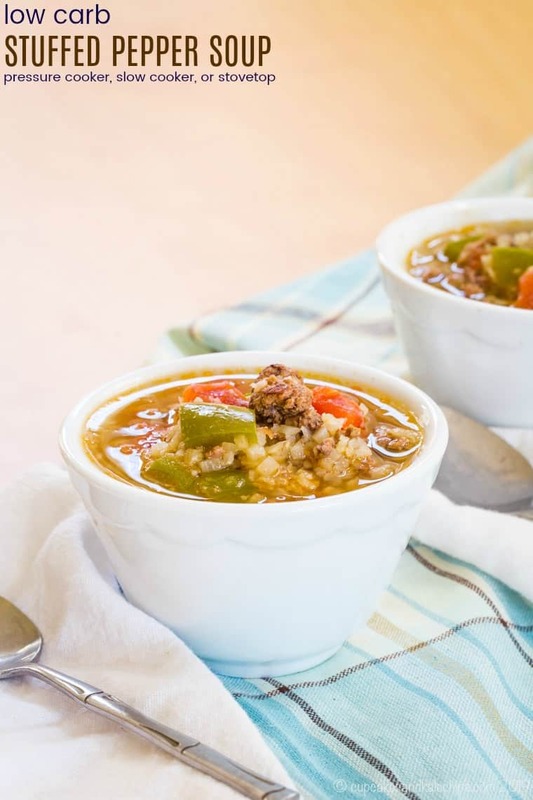 But in this low carb soup, you’ll warm your body and soul, and even squeeze in a few extra veggies. That’s always a good thing for everyone! Set the Instant Pot or other pressure cooker to the saute function. Once hot, add the ground beef and cook until mostly browned, breaking it up as it cooks. Add the onions and garlic, season with salt and pepper, and saute for another 4 to 5 minutes, or until the onions are translucent. Stir in the broth, bell pepper, tomato, Worcestershire sauce, and red pepper flakes. Seal the pressure cooker and set to the soup function for 10 minutes. After the cooking time is complete, manually release the pressure and open the lid. Add the cauliflower rice, seal, and set to the soup function for 3 minutes. After the cooking time is up, manually release the pressure. Add salt and pepper to taste. In a large skillet over medium heat, saute the ground beef until mostly browned, breaking it up as it cooks. Transfer to a slow cooker. Cook on Low for 6to 8 hours, adding the cauliflower rice during the last 30 minutes of cooking. Season with salt and pepper to taste. In a large saucepan over medium heat, saute the ground beef until mostly browned, breaking it up as it cooks. Transfer to a slow cooker. Bring to a boil, reduce heat, and simmer for 30 minutes. Stir in the cauliflower rice and cook until tender, about another 5 minutes. Season with salt and pepper to taste. Just wondering how to make cauliflower rice as I have never made it ..
Making cauliflower rice is really easy! It’s just a matter of putting cauliflower florets through a grating blade of a food processor or by grating it with a box grater. I explain exactly how to make it in this post for brown butter cauliflower rice. I don’t see the tomato in the ingredient list. It is called for in the directions, but no listed amounts. I’m so sorry, it’s there now. It’s just one medium tomato, chopped. 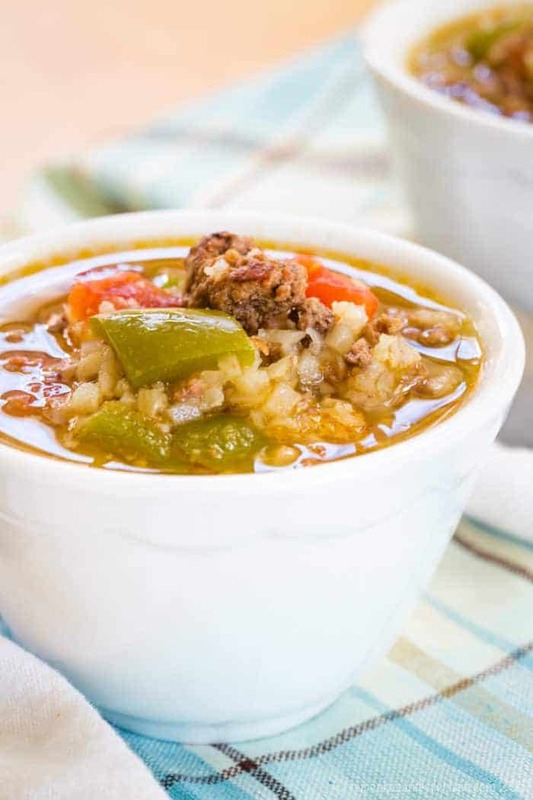 I am so excited about trying this stuffed pepper soup in my small crockpot it is storming outside and I have everything in the freezer so I can make this and have it for dinner thanks! That’s wonderful! I hope you enjoy the soup… it’s perfect for a rainy night!